BROSSARD, Que. 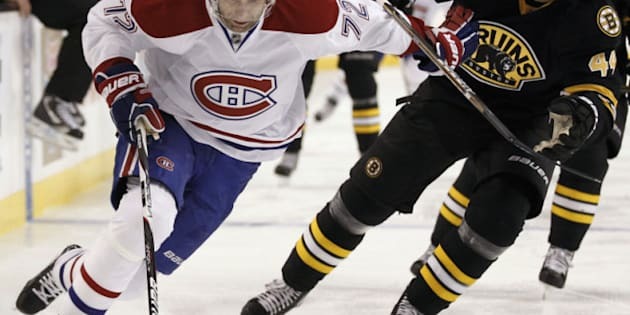 - For better or worse, playing for the Montreal Canadiens has been all that Erik Cole expected when he signed as an unrestricted free agent last summer. The Canadiens (13-12-7) got just what they wanted in Cole, a big, fast right winger who can score goals. And Cole got what he wanted: a four-year contract paying US$4.5 million per season on a playoff calibre team in a market where hockey is king. But as ''awesome'' as Cole finds playing before 21,273 of the NHL's noisiest fans, wins on home ice have been alarmingly rare so far this season. Cole has a goal in each of the last four games to take over the team lead with 12, one more than Max Pacioretty. Both big wingers were crowding the crease when David Desharnais, the playmaker, got his fifth of the season in a 4-3 loss to Philadelphia on Thursday night. But with captain Brian Gionta missing the last three games with an undisclosed injury, the second unit with Tomas Plekanec and Michael Cammalleri has struggled. Cammalleri had seven shots against the Flyers, but nothing is going in for the stocky sniper. Forwards Scott Gomez, Travis Moen and Ryan White are also injured, testing the depth on the other lines. After spending his first nine seasons with the Carolina Hurricanes, except for a 63-game stint in Edmonton in 2008-09, Cole was ready to move. But both the positive and negative sides of performing at the Bell Centre were evident against the Flyers. As uplifting as the long, loud standing ovation they gave to local prospect Louis Leblanc after he scored his first NHL goal in the second period may have been, the prolonged booing after the home side failed to score on a one minute 40 second two-man advantage at the end of the first was equally intense. The loss left Montreal 5-6-6 at home this season — five regulation wins in 17 games from a team that was 24-11-6 on home ice last season. On Saturday night, they will close a three-game homestand against the New Jersey Devils, then play six in a row on the road, where they are 8-6-1. ''Our home record is a little tainted in that we weren't playing very good in October,'' said Cole. ''But I've also said about this crowd is that they can drive the team north or south. ''Some nights when things aren't going well, or we're in a game that is still to be decided, it's not always the most motivating factor hearing the crowd boo you for an extended period of time. It goes both ways. It's one of the things that makes it special, but it's also one of the things that can increase a visiting team's success level, for sure. Coach Jacques Martin said the trouble at home stemmed in part from problems on the power play that they hoped were fixed when they turned to Carolina again to acquire veteran defenceman Tomas Kaberle in exchange for rearguard Jaroslav Spacek a week ago. A previously cold Canadiens power play has scored in each of the three games Kaberle has played. Another factor was injuries on defence which forced Martin to give plenty of minutes to first-year players Raphael Diaz, Alexei Emelin and Frederic St-Denis, who has since returned to AHL Hamilton. Diaz has emerged as one of the team's top four defencemen, while Emelin has been in and out of the lineup since veteran Chris Campoli returned from an injury. Leblanc scored despite having only 4:21 of ice time, and Martin suggested that despite his popularity with the fans the 20-year-old will be back in Hamilton when enough veteran forwards return from injury. So will Mike Blundin, who played only 3:12. ''He's a young player we like,'' Martin said of Leblanc. ''He still has a lot to learn. Moen skated and said he felt better but Martin said he was doubtful to play Saturday. Same with Diaz, who missed Thursday's game with an illness. He does not expect Gionta, White, Gomez or defenceman Andrei Markov back any time soon. Gomez looked close to returning, but had a setback this week and is not skating.